Is Twitter just a marketing tool? My world has just been shattered. Ok, perhaps that’s a little too dramatic, but today I experienced what it feels like to have my carpet pulled from under me (during the first-half that is). One of my long-time Twitter follows @GuyKawasaki had defied my laws of Twitter use without remorse, but made up for it later with useful tips for business use. 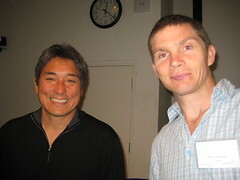 This morning I attended an event at Imperial College London, organised by MIT Enterprise Forum of the UK, Twitter – weapons of mass construction with Guy Kawasaki – Alltop, Nick Halstead – founder of Tweetmeme, Mario Menti – Twitterfeed) to discuss Twitter and offer some tips and tricks. Whilst I was getting over Guy’s devastating and cold disregard for my Twitter beliefs, he surprised me with loads of extremely useful tips that can be applied at work – using Twitter purely as a Marketing tool. … all to drive traffic to alltop.com. Also, at the event was tweetmeme.com which allows you, as a publisher, to chose one of four buttons (via a plugin) on an article. 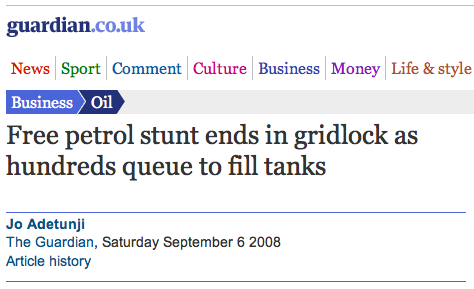 The button allows visitors to tweet the story directly from the article page. Planned for release soon is Tweetmeme’s report and tracking suite. The suite of apps will allow the account holder to track clicks and RT’s and better manage activity. With ~150,000 followers Guy strongly advocates automation. Automation of as many services as possible – especially useful when he travels. Part of the automation process includes auto sending of tweets and ghost tweeting – tweeting using a false name. Finally, when Guy constructs a tweet manually (yes, he still tweets manually when at his desk) he includes two link portions to a tweet – one directly to the story and one to alltop.com’s channel/section page. When users click on the links from his tweet the target url is framed with an Alltop.com leader to help promote Alltop.com more. Guy assured us that website owners should not feel cheated, but rather pleased that a tweet of his has directed users to their website. As the event drew to a close I couldn’t help but wonder how I might apply his useful steps to a work situation. Perhaps I might see if it works with some of our product teams. A new marketing initiative started by our CEO (kudos to her) encouraged marketers to show case their work to the entire company. The idea is simple: share the creative love. The afternoon was a huge success. Personally, I would have loved to see more of the creative process included: marketing’s process of ideation, brain storming through to mocks, comps and finally the designs I enjoyed. My hope is this initiative becomes commonplace and spreads to other areas of the company too. Clever marketing or silly idea? The opportunity to fill up with petrol for free caused gridlock yesterday after hundreds of drivers queued for up to an hour to get £40 of free fuel. Computer games publisher Electronic Arts took over a petrol station in Finsbury Park, north London, intending to give away £20,000 of petrol on a first come, first served basis during a stunt to promote Mercenaries 2: World in Flames, a game in which Venezuelan mercenaries fight for control of oil supplies. Even though Electronic Arts‘s actual advertising stunt ‘failed’ – give £20k of free petrol away – the real/clever marketing has only just begun. I wonder whether Seth Godin might label this a Purple Cow tactic or simply a silly idea? Social media is everywhere… not more so than in the enterprise environment. Lets face it senior marketers and digital managers need to be involved (or seen to be involved). If you’re thinking about it it’s already too late. While there’s nothing wrong with engaging your business in a social media soup (Twitter, Flickr, FriendFeed, Ning, Upcoming, YouTube, Del.icio.us, etc..), I can’t help wonder how these managers are forgetting that social media integration must form part of a structured content strategy. Successful social media efforts cannot simply be added on to existing products and expect to work perfectly. Like many other business ventures, a successful social networking campaign revolves around using good information to drive smart decisions. Gather qualitative and quantitative information and then use it to define project goals. An ill-defined project is substantially less likely to succeed. Ever heard “It looks cool, just put it in the website“, “find somewhere to put it!” or “Just plug it in!“? A common knee-jerk response by many digital managers is to jump on the bandwagon and simply plug these easily-malleable platforms into their websites. Enterprise has been left behind and now needs to catch up. More and more senior stakeholders feel left behind. So, their immediate reactive response is add add add. Everyone’s talking about it so it should be good, shouldn’t it? Carefully integrated social media efforts can hugely benefit a brand and generate a buzz.